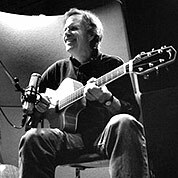 Leo Kottke is an acoustic guitarist. He is widely known for his innovative fingerpicking style, which draws on influences from blues, jazz, and folk music, and his syncopated, polyphonic melodies. Kottke has overcome a partial loss of hearing and a nearly career-ending bout with tendon damage in his right hand to emerge as a widely-recognized master of his instrument.